CALGARY, April 19, 2018 /CNW/ – Cequence Energy Ltd. (“Cequence” or the “Company”) (TSX: CQE) is pleased to announce that it has disposed of its remaining assets located in north eastern British Columbia effective April 1, 2018, for nominal consideration. 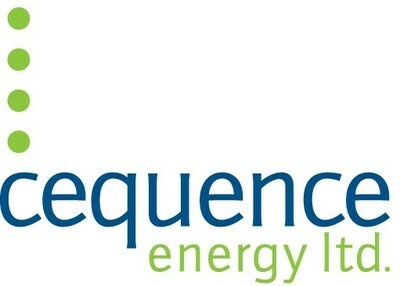 Upon closing of this transaction, Cequence becomes a pure Alberta operating entity with a corporate April, 2018 Alberta Energy Regulatory Licensee Liability Rating of 5.7. In the fourth quarter 2017, production associated with the B.C. assets was approximately 663 boe/d with an operating loss of $172,000 for the same period due to low commodity prices. The Company’s asset abandonment and reclamation obligation for B.C. at December 31, 2017 was $8.8 million or 23% of Cequence’s total reported year end 2017 liability of $38.5 million. The above three wells all had lateral lengths greater than 2 km with an average of 39 slick water frac stages placed. Water production associated with the wells are still below fracture treatment load recovery. The original estimated Corporate IP 30 rate per well was 300 bbl/d. With spring break up conditions occurring, consistent run times for the new wells may be challenging. In order to accommodate the increased new oil volumes and achieve stable run times, base Dunvegan oil production has been temporarily curtailed. While management is very encouraged by the early production results from these wells, such results are not necessarily indicative of long-term performance or of ultimate recovery from the wells. Cequence estimates there are approximately 26.5 net Dunvegan oil locations remaining on its land. Certain statements included in this press release constitute forward-looking statements or forward-looking information under applicable securities legislation. Such forward-looking statements or information are provided for the purpose of providing information about management’s current expectations and plans relating to the future. Readers are cautioned that reliance on such information may not be appropriate for other purposes, such as making investment decisions. Forward-looking statements or information typically contain statements with words such as “anticipate”, “believe”, “expect”, “plan”, “intend”, “estimate”, “propose”, “project” or similar words suggesting future outcomes or statements regarding an outlook. Forward-looking statements or information in this press release include, but are not limited to, statements relating to the Company’s production and future performance expectations of the recently completed Dunvegan wells, and the estimated number of oil locations remaining on the Company’s land. Forward-looking statements or information are based on a number of factors and assumptions which have been used to develop such statements and information but which may prove to be incorrect. Although the Company believes that the expectations reflected in such forward-looking statements or information are reasonable, undue reliance should not be placed on forward-looking statements because the Company can give no assurance that such expectations will prove to be correct. Forward-looking statements or information are based on current expectations, estimates and projections that involve a number of risks and uncertainties which could cause actual results to differ materially from those anticipated by the Company and described in the forward-looking statements or information. These risks and uncertainties may cause actual results to differ materially from the forward-looking statements or information. The material risk factors affecting the Company and its business are contained in the Company’s Annual Information Form which is available on SEDAR at www.sedar.com.